Rachid Ghannouchi interview: The Tunisian leader of the Ennahda party on Tunisia and the Arab Spring. 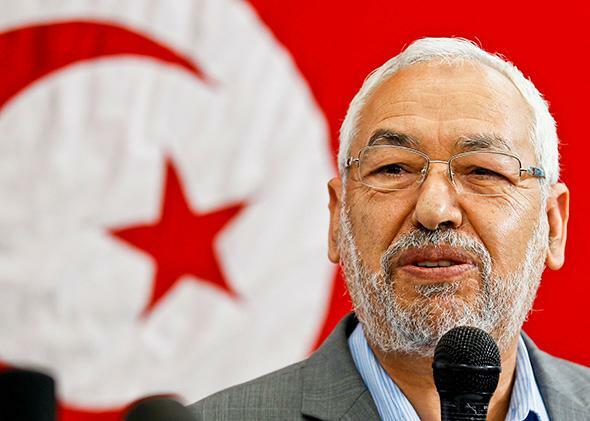 An interview with Rachid Ghannouchi, the leader of Tunisia’s largest political party. Rachid Ghannouchi, leader of the Ennahda movement, Tunisia’s main Islamist political party, speaks at a news conference in Tunis on June 13, 2012. Lally Weymouth: Can the parties in the long-running national dialogue—including yourself and the other political parties—decide on a new prime minister this week? Rachid Ghannouchi: I believe that we will be reaching an agreement before the end of this week. Can you and opposition leader Beji Caid Essebsi agree on a prime minister? Ennahda and Nida Tounes are the largest parties in the country, so definitely an agreement between these two parties would facilitate an agreement with the other parties. Reportedly, Ennahda is seeking certain guarantees in order to leave power—it wants guarantees that its members won’t be prosecuted for anything they might have done. No, we haven’t asked for what you call guarantees. These are our conditions: We will resign from government [and turn over power to a technocratic government], but the price we ask for is that the country gets a democratic constitution that enshrines and protects freedoms and rights, and secondly that they give the people an election date and an election commission. But we are not asking for any protection for ourselves because we haven’t done anything wrong. Things haven’t gone well in the past two years while you’ve ruled this country. The economy is in terrible shape. There is a security problem—two secular politicians have been killed. Your army is now fighting the jihadis at the Algerian border. You’ve had serious problems ruling the country, isn’t that correct? I’m not going to say that we have achieved great successes over the last two years, but we have to remember the country is going through a transitional period after the revolution. Compare our situation to other countries in a similar situation—Libya, Syria, Yemen, Egypt, and other Arab Spring countries. Tunisia is obviously faring much better. It is the last candle still shining in the Arab Spring despite all the winds that are blowing at it. Let us look at the economy. There are some exaggerations in what the opposition is saying. We have dedicated over a fifth of the budget to developing the areas inside the country that have suffered most in the past. One of the reasons the revolution happened is because of inequality. For the last 60 years, the areas inside the countries didn’t receive much development. If you look at the constitution—which is nearly ready now after two years—it enshrines all the values of the revolution, like freedom of association, freedom of expression, and equality for women. Does it really? Because you wanted to make women “complementary” to men, rather than equal—second-class citizens. We took everything that is contentious out of the constitution. But you took it out under pressure. This [term] “complementary” goes both ways: Man complements woman. A woman complements man. Who has the power if the woman wants to own land or divorce her husband? Under Tunisian law, a woman can divorce her husband. Total equality. The constitution is nearly finished, and we worked very hard on producing a constitution that represents all Tunisians, not just a part which is the Islamists. Eighty percent of our trade is with Europe, but many countries like Italy, France, and Spain are going through economic problems, and this is affecting our exports and our economy. Taking this into consideration, I don’t think we have done a bad job. Some say you have made compromises, and there are Ennahda hard-liners who are unhappy. At least they haven’t thrown me out yet. There are disagreements in the party on what decisions to make and compromises to give. In the party congress, I wasn’t elected by 99 percent, like Ben Ali. Seventy percent voted for me. Maybe this 70 percent has gone down a bit because of the compromises we had to give, but I think the majority of the party still supports the choices we have made. Why did your party do so little during the attack on the U.S. Embassy in 2012? Why did it allow the Salafist protesters to storm the embassy? It’s said that the attack was permitted because your party sympathizes with the Salafists and did not want to attack them as Ben Ali used to attack protesters. We condemned the attack on the American Embassy and consider it a big security failure on the part of the government. This incident has resulted in a complete change in our policy towards the Salafists and [the radical group] Ansar al-Sharia. Before that, we used to try to convince them to work within the law. But from this moment on, we realized these people do not accept to work within the boundaries of the law, and that is why we started cracking down on them. The government later designated them as a terrorist organization, and the security forces have been working hard against them. When did the government classify them as terrorists? After the assassination of the opposition leader Mohamed Brahmi in July? After the assassination of Brahmi last July. But the war against them started months before—tackling their networks. Are there jihadi training camps in Tunisia? No. There have been rumors about them training in Iraq, and some have fought in Iraq and Afghanistan. Some people say that because of the lawlessness in Libya, some are training there. And maybe in Mali as well. Is Tunisia the only place where the Arab Spring might succeed? It has failed in Egypt. In order to succeed, will whichever party is in power have to make compromises? I believe democracy will succeed in Tunisia, but I also believe that it will succeed in the other Arab Spring countries. In our modern age—in the age of free information—I don’t think there is any place for dictatorships. You can see this very clearly in Egypt after the coup. When you saw the coup in Egypt, were you concerned that this could happen to you here in Tunisia? Some people in the opposition hoped that what happened in Egypt would happen in Tunisia. But then when they saw the massacres on TV, the opposition started distancing themselves from the Egypt scenario. We have exported revolution—the Arab Spring—to Egypt, and we don’t want to import from Egypt a coup. I hope that with the success of the transition to democracy in Tunisia that we will export to Egypt a working democratic model. Some argue that former Egyptian president Mohamed Morsi made mistakes: giving himself immunity from prosecution, refusing to compromise with secular groups. Morsi committed mistakes, but they don’t justify a military coup. And whatever mistakes were committed do not justify Western countries staying silent about the dictatorship that is being built in Egypt. You mean the United States? The West shouldn’t stay silent about the massacres, the repression, and the beginnings of a dictatorship that are being built. Morsi put himself above the law; he refused to talk to any of the secular groups. Despite everything we say about Morsi—and he has committed mistakes—not a single massacre was committed, not a single journalist was imprisoned. The media now is being controlled by the military junta to be a mouthpiece for them. Did you have a good relationship with President Morsi? I know him. Yes, I respect him. You are a senior member of the international Muslim Brotherhood? We [Ennahda] are a Tunisian party. Aren’t you the head of the political bureau of the international Muslim Brotherhood? No, you are talking about the International Union of Muslim Scholars. It’s not political. It is run by Sheikh Yusuf al-Qaradawi [one of the top Muslim Brotherhood ideologues]. It is not a coincidence that Tunisia was the first country of the Arab Spring. I believe that Tunisia will be successful in presenting a successful democratic model because we have a homogenous society, with a small Jewish minority. Education is widespread; we have a large middle class, which supports democracy. We have a moderate Islamic party, which has been one of the champions of the idea of the compatibility between Islam and democracy. We could have written the constitution on our own, but we didn’t do this because we wanted the constitution to be written not just by Islamists but by everyone. After the elections, we chose to form a coalition government not with other Islamists but with other secular parties because we wanted to send a message that the country is for everyone. Many believe Ennahda is not moderate—that it is a party with a serious Islamist agenda. Many tried to scare people off Ennahda by claiming Ennahda would impose strict dress rules. But if you walk around the streets, you find women choosing whether they want to wear a scarf or not. The opposition also tried to scare the West by saying that if an Islamic party comes to power, it would cut off relations with the West. After two years, we have a much more developed relationship with Europe and the U.S. In 2011, you predicted the end of Israel. Do you expect this to come true? This is the first time I’ve heard about this. What do you think of Israel? There is a problem there that hasn’t been solved yet. There is a problem with occupation. So far, Israel has failed to reach an agreement—with [Yasser] Arafat in the past and Abu Mazen [Mahmoud Abbas] now. We hear that even Hamas is supporting the idea of a two-state solution, but we don’t see Israel going towards this solution. So you’re not trying to create an Islamic state with Islamic laws here? Tunisia, under the existing constitution ratified in 1959, is an independent state—Islam is its religion, and Arabic is its language. This is enough for us. In a democracy, it is parliament that makes the laws. We don’t want a theocracy on top of parliament. Some people tried to add sharia to the new constitution, and we have rejected these calls. People don’t agree on sharia, so we should leave it out. Why was nothing done to arrest the people who assassinated secular opposition politicians Chokri Belaid and Mohamed Brahmi this year? A number of the people who took part in the assassinations have been arrested by security forces. These assassinations were done by professionals, so it is difficult to arrest them. In the U.S., it’s still not clear who actually killed Kennedy. When and why did you create the party? In 1981. Here in Tunisia. It became the main opposition party. What happened when you founded the party? They threw me in prison in 1981 and sentenced me to 11 years. President Habib Bourguiba thought I insulted him and his government, and [that I] encouraged people to revolt. I spent four years in prison and was released and continued my activities, and in March 1987, I was arrested again and sentenced to life in prison. I was nearly sentenced to death. Bourguiba wanted me to get the death sentence, but then he was overthrown. I left prison in 1988. In 1989, general elections happened, and we participated and gained the majority. Prime Minister Ben Ali decided to falsify the results and to arrest me again. So I fled the country. I continued my campaign against the Ben Ali regime from outside until the revolution started. I was received again in Tunisia by thousands in January 2011. Why did you decide not to become prime minister? I prefer to leave the opportunity to the young people and my colleagues who suffered more than me. Ali Laarayedh, the prime minister, was sentenced to death two times.